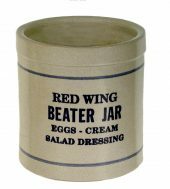 The Red Wing Beater Jar has been an American kitchen classic for over 100 years. The rounded inside bottom of this old-fashioned hand-thrown piece makes it a breeze to mix salad dressings, eggs, sauces and marinades. The Blue Fern decoration is shown in the photo.” Blue Fern ” is shown in above photo. 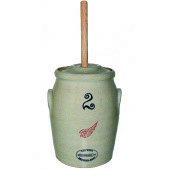 This hand-thrown, bottle-shaped butter churn is truly a work of art! It has a “belly” to create agitation as the wooden dasher is pulled up and down. Wooden dasher included.